Snowshoe Thompson’s Headstone — Stolen?? Here’s the fascinating tale about how Snowshoe’s grave got capped with concrete — and who’s sleeping in the long-forgotten grave next to him! John A. “Snowshoe” Thompson, as he looked about 1870. Snowshoe Thompson, you may remember, exited this life on May 15, 1876 at his ranch in Diamond Valley, California. Just 49 years old, this giant of a man was likely felled by an opponent he couldn’t fight: a burst appendix. 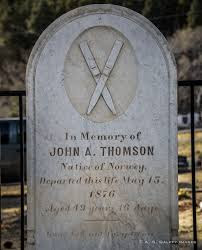 Erected by Snowshoe’s widow in 1885, Thompson’s headstone features a pair of crossed skis. It took nine long years before Snowshoe’s widow, Agnes, was able to have a tombstone placed on his grave. But when she finally did, the headstone was a thing of beauty. Carved of white marble, it features a carved pair of miniature skis, crossed in silent mourning. But though Snowshoe’s grave was now properly marked, it became something of a mess. 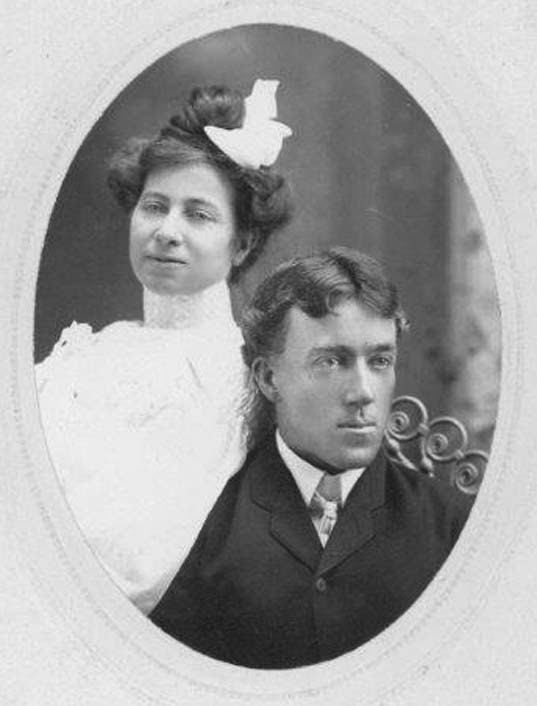 Agnes died in 1915, and Snowshoe’s only son passed away just two years after his father. With no one left to care for the family plot, the ever-present sagebrush and weeds began taking over. On that fateful 1924 Decoration Day, a thoughtful little girl from Gardnerville decided Snowshoe’s grave deserved a champion. A “self-appointed guardian angel,” she pulled the weeds and laid flowers on Snowshoe’s nearly-forgotten grave that year — and for years to come. Even though Snowshoe hadn’t died in a war, she felt he merited that special remembrance. Years passed, and eventually other school children took up the cause. Hearing that “persons unknown” had callously attempted to steal Snowshoe’s headstone (unsuccessfully, thank goodness! ), children in Genoa began raising funds to anchor his stone firmly in concrete. Snowshoe Thompson’s family plot is now neatly protected by a concrete cap — paid for by funds raised by Genoa school children. And thanks to their efforts, by the end of May, 1948 (now known as Memorial Day), the Thompson family plot had been covered over in two feet of heavy concrete. (They were taking no chances!) Public-spirited Genoans Carl Falcke, Sr., Arnold Juchtzer, and Joe Gossi pitched in to do the heavy labor. 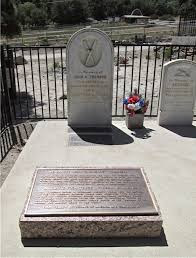 Thompson’s headstone was happily safeguarded from thieves, and his family plot protected from encroaching sagebrush. It’s a great tale of community involvement, and local generosity. Once unkempt, Snowshoe’s grave is now such a point of pride that special signs mark the way for eager pilgrims. 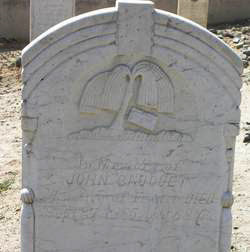 Next time you pay a visit to Snowshoe’s marble marker, take a brief look around for the long-forgotten grave of John Sauquet next door. Today, nobody even knows Sauquet’s name. But back in Snowshoe’s time, he was a “honcho” in tiny Alpine County. John Sauquet’s grave near Snowshoe’s, in Genoa Cemetery. The weeping willow is a symbol of mourning. Born in France about 1818, Sauquet was well over forty when he made his way to the mining boomtown of Silver Mountain City. He opened a general merchandise store there about 1865, selling groceries, provisions, mining supplies — and, of course, wines! (He was, after all, a Frenchman!) Sauquet did so well that between 1865 and 1870 the value of his inventory jumped from $800 to $2,000 — not an easy feat, in a town where mining busts typically followed the short booms. Sauquet tried his own hand at mining speculation, becoming a trustee (director) of the Mountain Mine. And when mining entrepreneur Lewis Chalmers racked up an unpaid bill approaching $4,000, Sauquet took title to the Imperial Silver Quarries mine as a way to satisfy his judgment. By February, 1881, however, Sauquet (now in his early 60s) had become ill. He ventured as far as San Francisco to consult a doctor, and in October, 1883, left Silver Mountain behind entirely, moving his merchandise from the now-nearly-abandoned town to the tiny settlement just below at Silver Creek. Sauquet hung on two more years, finally passing away September 27, 1885. 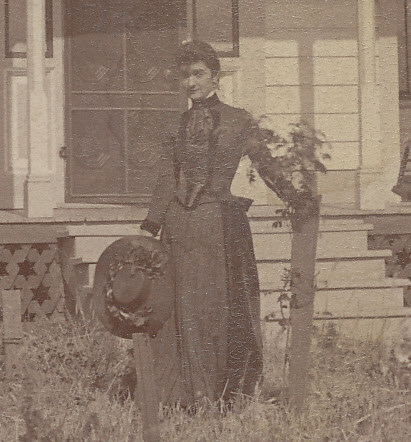 And here’s the fascinating connection to Snowshoe Thompson: Sauquet drew his last breath in Diamond Valley at the home of Agnes (Thompson) Scossa. Snowshoe’s widow and her new husband (John Scossa) took care of Sauquet in his final illness. As a token of his gratitude, Sauquet’s will left everything he owned to John Scossa — assets that included real property in San Francisco as well as in Alpine. All those old Alpiners knew each other. 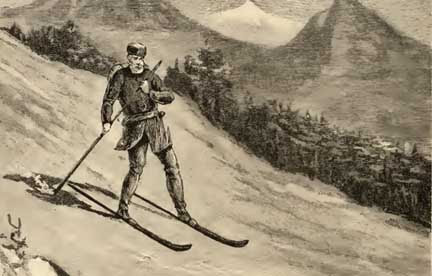 And Snowshoe Thompson — even though he’s buried in Genoa — was truly an Alpiner, too. And P.S. — Look closely at Snowshoe’s headstone — the “P” in Thompson is missing! Exactly why remains a mystery. But some say either Agnes or John Scossa may have accidentally given that misspelling to the stone-carver. 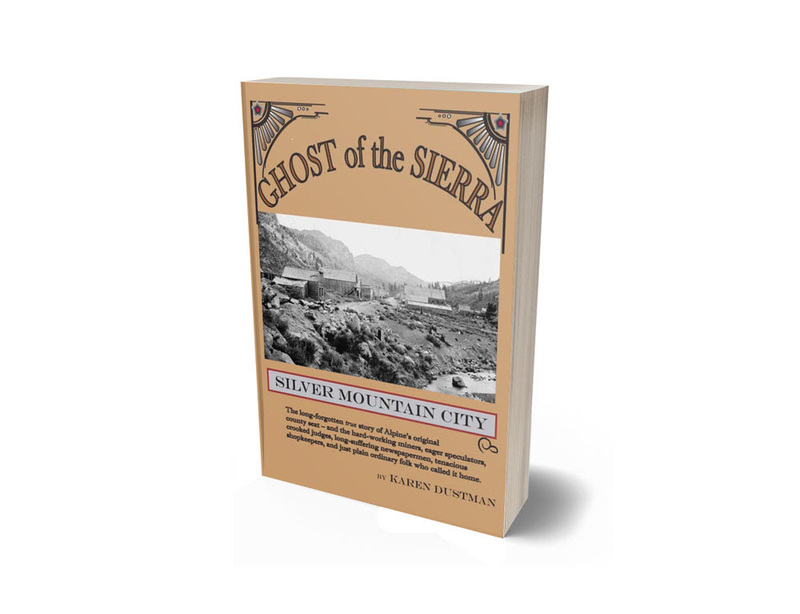 Like to read more of the stories, legends and amazing true tales about Snowshoe Thompson, Silver Mountain City, and Alpine’s wild and crazy silver mines? Jump in and grab a copy– you’re in for a wild ride! Eugene A. May was a long-time resident of of Empire, the early mining town east of Carson City. You might say he’s still a resident: his quiet grave is tucked in at the little Empire Cemetery, overlooking the valley. 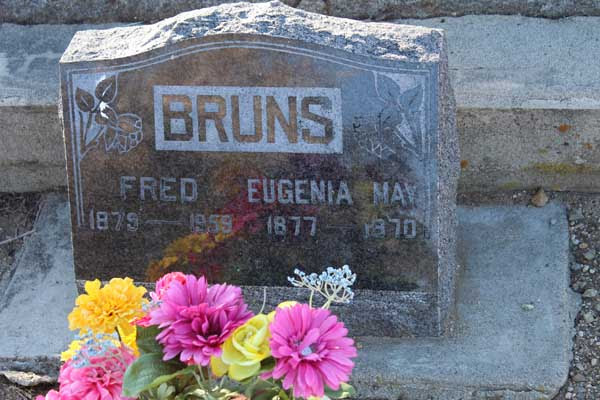 Little did we know when first saw his headstone — but May had a secret life! Known to his friends as “Hank,” May moved to Nevada about 1863 and was living at Empire at the time of the 1870 Census. Around 1878 he married a young widow named Eldorado, who had a one-year-old daughter named Jennie (Eugenia). 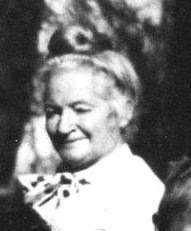 May was 47 years old at the time of their marriage and solidly middle-aged. Eldorado, on the other hand, was only about 24 — roughly half Hank’s age. Their age difference would raise eyebrows today, but May/December romances weren’t all that uncommon back then. And for a widow with a young daughter it was a practical match. 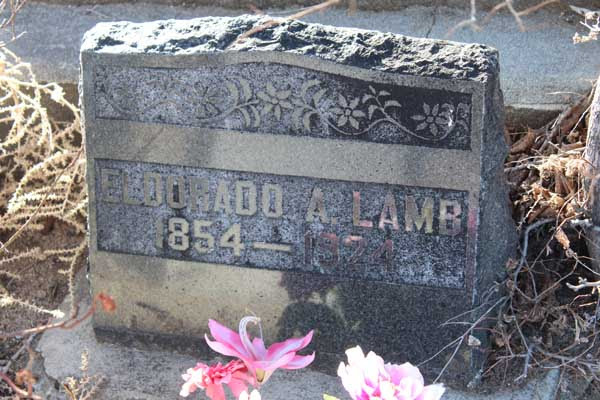 Eldorado’s first husband, Michael Dunigan, had died in 1877 after a fluming accident at Lake Tahoe, and women had few work options outside the home. Eldorado had young Jennie to think about. The steam-powered Mexican Mill was built in 1861 and could process 75 tons of ore a day. Nine men worked at the Mill, including foreman Hank May. The Mexican Mill eventually closed about 1885, but Hank remained on as a caretaker and watchman. When the mill was later remodeled to process gypsum (used for making cement), Hank was again employed. 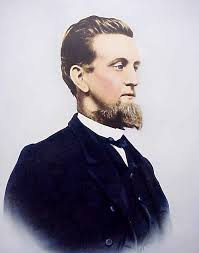 With his skills as a millwright, he also was called upon to help build other mills and hoisting works along the Carson River through the years, including the power plant at Rodenbaugh’s Station (the old Power Dam at Ruhenstroth). One morning in the winter of 1898, however, Hank May met with a tragic accident. According to Jennie, he “slipped near the dynamo and his arm was caught in a revolving wheel.” His arm was dislocated at the shoulder, and the bone was broken in three places. Eugene May was born in 1832. His gravestone incorrectly lists his death year as 1901 (he actually died in late 1900). Hank May lived for another two years, but never fully recovered. He died at his home in Empire in November, 1900. Rev. J.W. Durrance officiated at his funeral when Hank was laid to rest at the peaceful Empire Cemetery atop the hill overlooking the Mexican Mill where he worked for so long. Soon after Hank’s death, however, an astonishing story came to light. Hank’s friend, B.F. Denton, notified newspapers back in Hank’s home state of Illinois about his death, noting that his real name was not Eugene May at all! Eugene “Hank” May, it turns out, was actually Henry Head, son of a wealthy father (whose own name might produce chuckles today: Biggar Head). Hank aka Henry was born in Illinois in 1832, and grew up at Sand Ridge, between Edwardsville and Alton, Illinois. Biggar had evidently remarried, and Hank/Henry got into a dispute with his step-mother that led him to leave home about 1850, at the age of 18. By 1863 Hank/Henry had made his way to what would soon become Nevada; the 1870 Census shows him living in Empire. He not only left behind his home and his family, but also adopted a new name and kept his true identity a secret: he was now “Eugene A. May.” Denton, his friend since childhood, knew about the fiction but at Hank’s insistence kept mum. 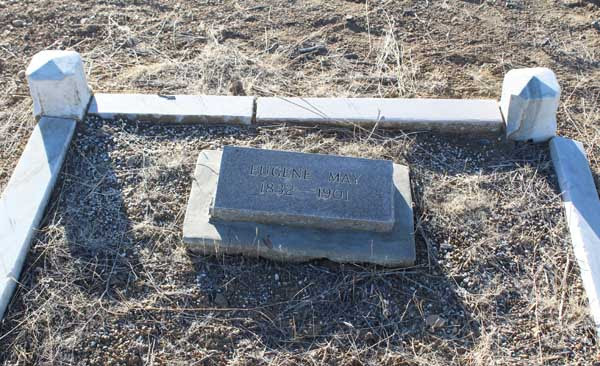 Eugene May’s quiet grave at Empire Cemetery. Eldorado must have stood here, shedding tears as she buried her second husband. Little Jennie, too, must have mourned over this grave; Eugene was the only father she had ever known. Here’s Eldorado in later life — still smiling, despite the hardships she lived through! BUT WAIT! THERE’S MORE, INCLUDING A SURPRISING LINK TO ALPINE COUNTY! Tune in next week to read the second half of this story, with more of the tale about widow Eldorado and her young daughter, Jennie! A giant thank-you for assistance with this story to Nevada historian Sue Silver for her amazing research on the Empire Cemetery! You’ll definitely want to check it out if you’re interested in any of the folks buried there. Her research is conveniently referenced by last name. Here is the link to her complete Empire Cemetery research online. The other great resource we found helpful for this article was www.Newspapers.com. If you haven’t already stumbled across it, it’s a subscription site but definitely worth it for finding obituaries and other stories across the country. For this article, for example, we turned up the Alton Telegraph (Illinois), December 6, 1900, which gave fascinating additional contemporary details about Denton and May’s “secret”. Enjoyed this story? Leave us a comment, below! And just use the buttons to share it.